Musicals typically aren't my "thing". There are a few that I thought were well done, such as Little Shop of Horrors and Moulin Rouge, but I don't tend to seek them out. However, with all the buzz going on about High School Musical 2, I figured I'd better sit myself down and see what all the fuss was about. So, you wanna know what everyone is talking about? Wanna know what makes this musical so great? Well, I'll tell ya... nothing! Absolutely nothing! I totally don't get why everyone was saying this was such a good film. It wasn't. I mean, it wasn't bad. It wasn't like 102 Dalmatians where I kept looking at the time left, hoping it would be over soon. Nope, it wasn't anything special, either. It was average, just average. Her first step in attempting to fix this situation is to order the club manager, Mr. Fulton, to fire all Troy's friends, but when he explains that he cannot do that because her mother approved the new hires, she switches gears and instructs him to make it so they want to quite. For step number two, she needs to find a way to drive a wedge between Troy and Gabriella. Her initial attempts, such as cutting on the sprinklers while the two are out on the grass, fail to make an impression, so she steps it up by making it so Troy continually receives special attention. He gets promoted, is given new duties, new expensive clothes, is brought to eat with her family, and is introduced to some professional basketball players. At first, Troy is dumbfounded, and confused. But eventually he begins to just accept what is happening, and rolls with it. Unfortunately, that also means that he starts leaving his friends behind. What I found strange was that this transition happened so suddenly. I mean, you've got a really great guy who cares for his friends and who doesn't want any special treatment, and then one scene later he's completely into it and dismissing his friends like they're servants. We've all seen this kind of story before, but usually the transition from nice guy to jerk is way more subtle. I guess they just spent too much time singing and dancing, and had to speed things up. And that's another thing, the singing and dancing. Just about all of the musical numbers felt like standard boy-band songs. Probably the only one that didn't feel that way to me was Humuhumunukunukuapua'a. None were really bad, they just weren't anything special. None stuck in my head, and I couldn't even hum a bar of any of the songs even though I just watched the thing like six hours ago. But the thing that really bugged me about the songs was the voices. The characters would be talking, and then all of a sudden when they would start singing, their voices would completely change. It's like somebody hit a switch to activate voice processing. That didn't happen in Little Shop or Moulin Rouge. This was a bit distracting, and didn't help the flow or transition one bit. Although I felt this movie was just alright, I think the release is actually really good, because there are a ton of extra features here. First is a sneak peek at High School Musical 3. Apparently that one will be released in theaters. And fans will be happy to know that everyone seems to come back. Next are some deleted scenes, all of which I agreed with. They didn't need to be in the movie. Let's see, then there's also a music video, and a dance along thing if you want to learn some of the dances. I didn't, so I skipped that. And then there is the whole Backstage Disney section. My wife always loves those, since they tend to contain a lot of featurettes, and this one is no exception. She also liked this movie more than I did, but then she likes musicals in general more than I do. 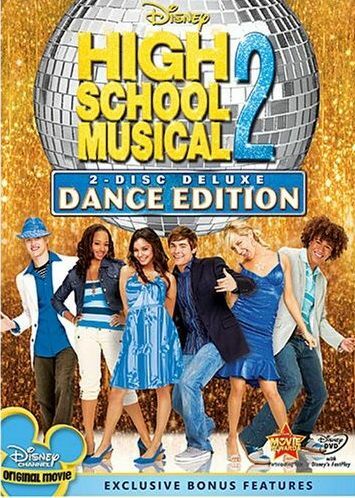 High School Musical 2 Deluxe Dance Edition , released by Walt Disney Video, is available starting September 23, 2008.